Background and objectives Serum calcification propensity is a novel functional test that quantifies the functionality of the humeral system of calcification control. Low serum calcification propensity is associated with higher risk of cardiovascular events and death in patients with ESKD. Increasing magnesium in serum increases (i.e., improves) serum calcification propensity in vitro, but so far, no clinical trials have investigated whether increasing serum magnesium increases serum calcification propensity in subjects with ESKD. Design, setting, participants, & measurements We conducted a single-center, randomized, double-blinded, parallel group, controlled clinical trial, in which we examined the effect of increasing dialysate magnesium from 1.0 to 2.0 mEq/L for 28 days compared with maintaining dialysate magnesium at 1.0 mEq/L on serum calcification propensity in subjects undergoing hemodialysis for ESKD. The primary end point was the value of calcification propensity, measured by T50, at the end of the intervention. Results Fifty-nine subjects were enrolled in the trial, and of these, 57 completed the intervention and were analyzed for the primary outcome. 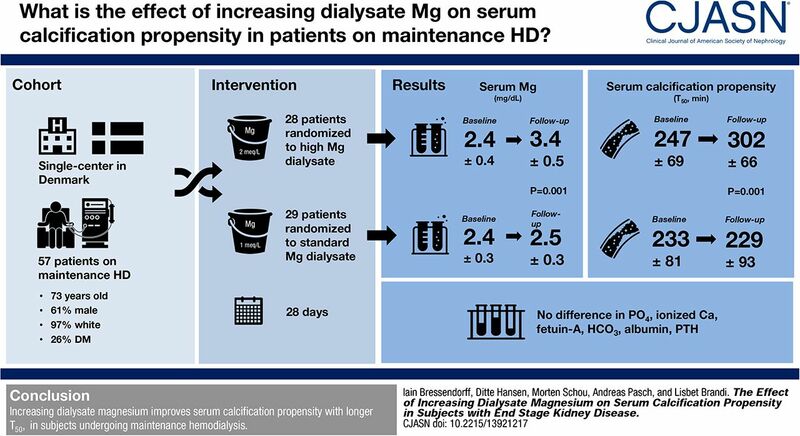 In the standard dialysate magnesium group, serum calcification propensity was 233±81 minutes (mean±SD) at baseline (mean of days −7 and 0) and 229±93 minutes at follow-up (mean of days 21 and 28), whereas in the high dialysate magnesium group, serum calcification propensity was 247±69 minutes at baseline and 302±66 minutes at follow-up. The difference in serum calcification propensity between the two groups at follow-up (primary analysis) was 73 minutes (between-group difference; 95% confidence interval, 30 to 116; P<0.001), and the between-group difference in serum magnesium was 0.88 mg/dl (95% confidence interval, 0.66 to 1.10; P=0.001). Conclusions Increasing dialysate magnesium increases serum calcification propensity in subjects undergoing maintenance hemodialysis. Magnesium Concentration in Dialysate: Is Higher Better?